Along with the Scandinavian countries, per capita the Japanese government is one of the biggest sources of foreign assistance and overseas development projects. Much of this aid from Japan comes through the quasi-governmental agency, JICA, Japan International Cooperation Agency. 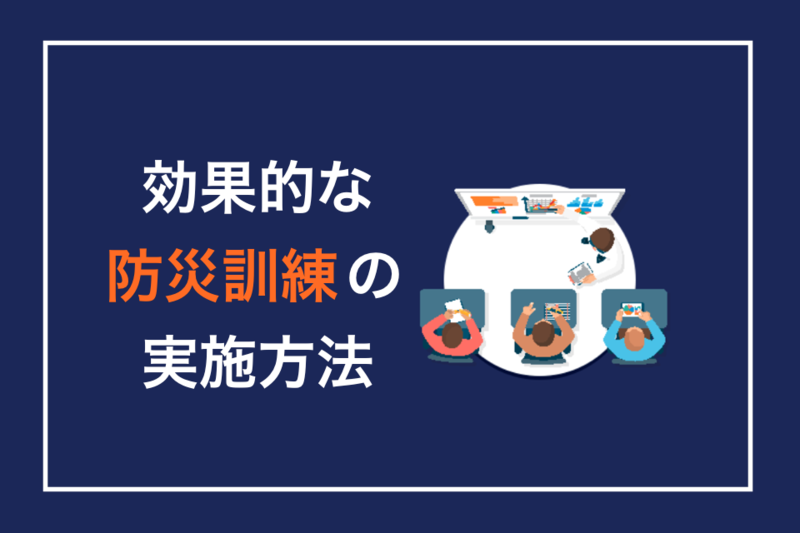 It takes three forms: training of foreign nationals who come to sites in Japan, grants-in-aid (no debt to repay to Japan), and the dispatch of Japanese technical experts to lend consulting guidance to the receiving country. The subjects of aid include things like road improvements, dams, bridges, as well as health care and educational opportunities. But also there are a few instances of disaster risk reduction as described by the “build back better” idea in the 2015 Sendai Framework. Looking at the PDF summary of the Latin America project that the JICA published, there are several important points to consider. The training, conversations, and practice took place 2007-2012 in six countries: El Salvador, Nicaragua, Guatemala, Costa Rica, Honduras and Panama. 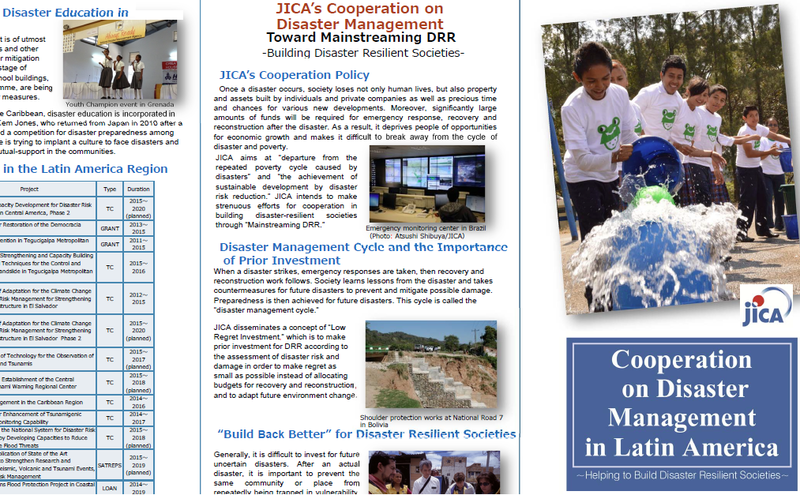 In the 2015 JICA annual evaluation report there is a case study that scores the Central American projects (pp. 42-42). 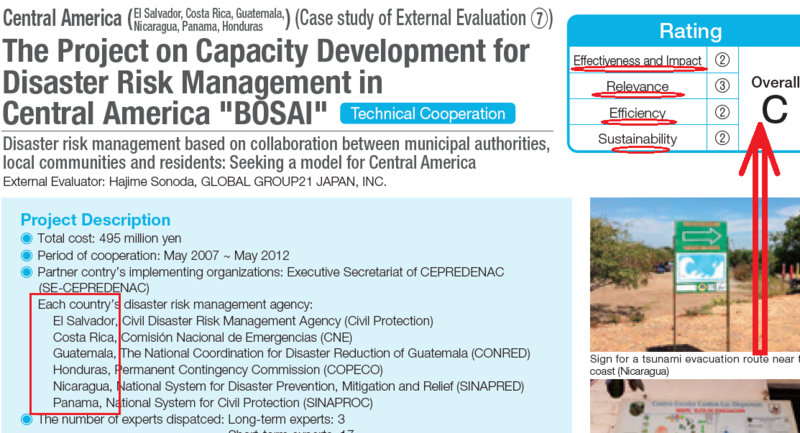 The external evaluators studied what part of the project developed finally into a practical improvement for the local people and their government and emergency managers, and what part of the JICA effort did not succeed in raising the disaster response capacity of each country. According to the report, the overall grade for the 5 years across all countries was “C” with notable differences summarized in a table to show the score for national, municipal district, and local community or neighborhood level. Using this lens to look at the work showed that Panama was the lowest for making use of the JICA involvement; Nicaragua was the highest. The evaluators scored the project’s relevance, efficiency, impact, and sustainability. 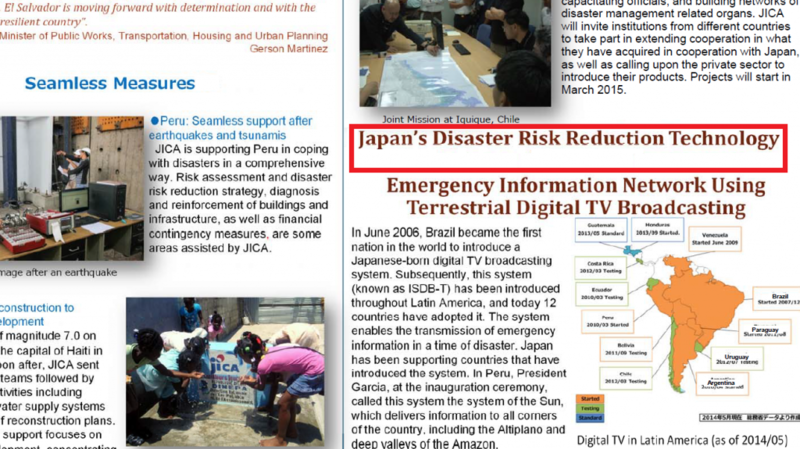 Compared to other parts of the world and other subjects for JICA projects, this one for DRR was about the same or slightly less successful according to formal assessment. Cold numbers, though, do not record the value to the local village that has improved their resilience to disaster. For such a family or business, the project was fully successful. 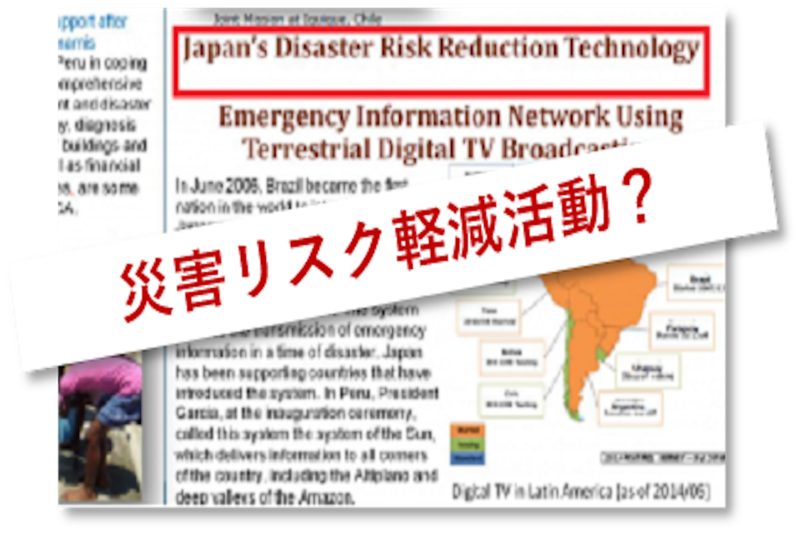 JICA projects for DRR have many kinds of significance, apart from businesses touched by the project money (suppliers of equipment, services of transport and lodging, etc). For the receiving country the project raises awareness among the officials and with the local residents. New ideas or ways to see the location come from the Japan visitors. Sometimes there are changes to the old system that come as a result; sometimes entirely new systems come with the project plans and training. In the 2007-2012 Central America project (495 million JPY) the equipment included vehicles, office equipment, and a system of early warning input (sensors) and output (public speakers, software, and so on). 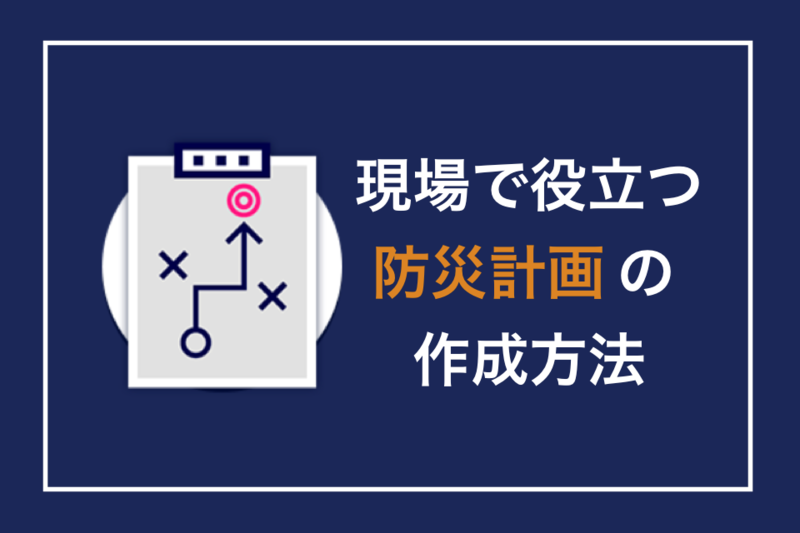 But there is practical benefit to Japan’s government and people, too: the effort needed to teach or train others helps to build one’s own expertise, too, which then may be used in the home country (Japan). It may be that local solutions and adaptation of the JICA ideas in the receiving country also lead Japan to see their own situation back in Japan in a new way, too. So both the giver and receiver benefit in practical ways, not just as goodwill gesture, political prize to show off, aid to potential export market consumers, or sense of duty. Instead, the improvements to disaster readiness in Central America are material, social, economic, and psychological. It will be interesting to see JICA projects in DRR continue for another generation and to see actual disaster responses, thanks to these DRR efforts now.